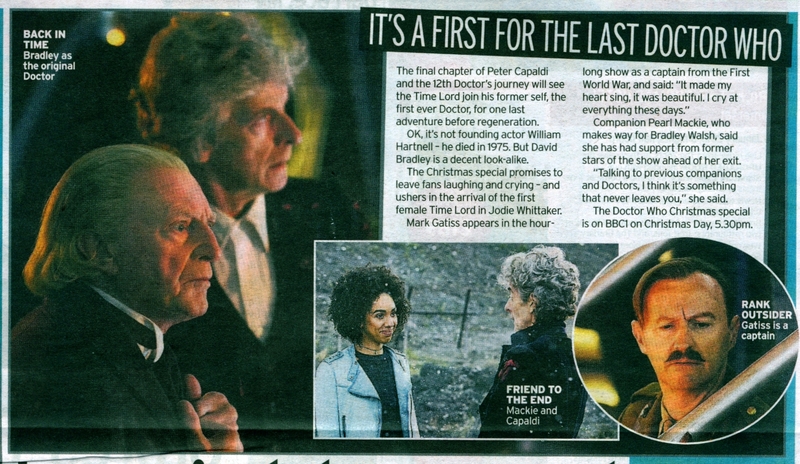 The final chapter of Peter Capaldi and the 12th Doctor's journey will see the Time Lord join his former self, the first ever Doctor, for one last adventure before regeneration. OK, it's not founding actor William Hartnell - he died in 1975. But David Bradley is a decent look-alike. The Christmas special promises to leave fans laughing and crying - and ushers in the arrival of the first female Time Lord in Jodie Whittaker. Mark Gatiss appears in the hourlong show as a captain from the First World War, and said: "It made my heart sing, it was beautiful. I cry at everything these days." Companion Pearl Mackie, who makes way for Bradley Walsh, said she has had support from former stars of the show ahead of her exit. "Talking to previous companions and Doctors, I think it's something that never leaves you," she said. The Doctor Who Christmas special is on BBC1 on Christmas Day, 5.30pm. APA 6th ed. : Yaqoob, Janine (2017-12-17). It's A First For The Last Doctor Who. The Sunday Mirror p. 21. MLA 7th ed. : Yaqoob, Janine. "It's A First For The Last Doctor Who." The Sunday Mirror [add city] 2017-12-17, 21. Print. Turabian: Yaqoob, Janine. "It's A First For The Last Doctor Who." The Sunday Mirror, 2017-12-17, section, 21 edition.